When it comes to customer service, the shift towards a superior customer experience is no longer optional. Consumers expect a seamless, cross-channel, real-time experience and companies and brands, B2B and B2C alike, recognize that they must become customer obsessed if they want to keep and gain market share and grow their businesses. In our digital economy, customers have unprecedented access to the tools and the resources that empower them to make better-informed decisions about where they take their business and research shows that the customer experience plays a key role in those making those decisions. And Millennials are at the forefront of all the action. In this guide we will delve into the current state of customer service and customer experience and how it pertains to Millennials. We will investigate facts (and myths!) about Millennials’ behavior on and offline as it relates to purchasing to gain a better understanding of their preferences. We will also discuss how Millennials themselves are shaping and influencing the very customer experience practices that cater to them. Then we will outline the relevant technologies and technology trends that influence and define the Millennial customer experience before laying out suggestions for the digital transformation of your business and defining best practices for the application of digital customer data. Stick with us for this guide. It’s loaded with interesting data on today’s digital consumers and Millennial consumers as well as some useful statistics around customer experience. Millennials are also the first generation of digital and social natives. They grew up with computers and the internet, and Google launched when they were still relatively young, so they have always felt comfortable conducting comprehensive online research. They're always connected and it is second nature to go online with whatever device is most convenient at the moment to find the solution to a question or a problem. This digital first nature has had profound effects on the state of customer experience, which will be discussed in the next section. Millennials also hit the workforce during the 2008 economic downturn and it was a formative experience for many. Some may have struggled to find a job in the first place, and most Millennials entered the workforce with significant student debt. Millennials work hard to earn their money and they are very careful about how they spend it. The rise of smart, connected devices coupled with the expansive popularity of social media has empowered customers to expect and demand more in return for their spending. At the same time, these trends have given brands and companies an exciting new opportunity to rise to the occasion and beat out their competition by providing delightful customer experiences. Millennials have high standards for fast and consistent cross-channel, cross-platform experiences, and they are quick to adopt technologies and connect with brands that can meet those standards. They expect a consistent experience across all touch points and they can easily take their business to a competitor if they can provide the fast, innovative experience that they crave. A consistent, multi-channel customer experience increases customer satisfaction and retention and it can drive increased revenue. There is also an enormous potential to gain valuable insights every time there is a customer interaction that can help your business get ahead of the customer experience curve. 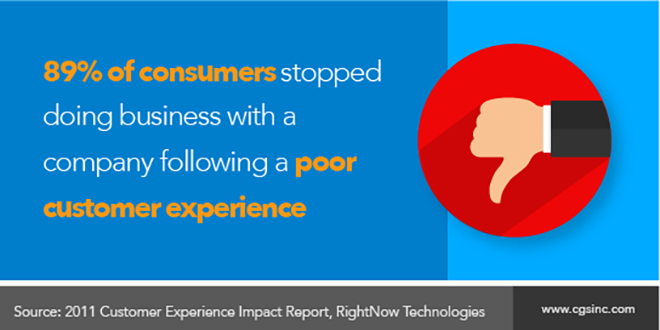 Customer experience has truly become a competitive advantage. Second only to word of mouth from friends or family, Millennials who are in the market for a specific product or service trust and devour user and consumer generated content in order to maximize their decision making process. In addition to consumer generated content and reviews, Millennials consider their overall experience with a brand or company and how that brand or company treats its customers. And they achieve that visibility in several ways – across networks and multiple devices. Millennials are helping to shape the rules of customer service with this connected, mobile and digital behavior. Any customer experience strategy should take into consideration the fact that a 140-character Tweet or an iPhone video posted on social media has the potential to cause irreparable damage to a brand. In 2007, a YouTube video of rats in a Taco Bell in New York City went viral. This viral video actually caused YUM! Brands Inc. stock prices and sales to both drop. Customers are now empowered to make their voices heard via social media. Interactive, real-time customer care is expected and the blowback from ignoring or not meeting those expectations can be devastating, which is why companies and brands are crafting strategies to provide real-time, proactive customer care. It's been a while since social media ushered in the age of authentic and transparent customer service, but those same rules still apply. Customers expect fast service and an authentic explanation communicated in a genuine, personable tone. To ignore this concept is to risk loss of business as a result of damage to your reputation or negative word of mouth spreading like wildfire. And since the technology exists to make it happen, you better believe that Millennials expect to get the service they deserve. Salesforce reported that consumers that don’t use social media will share a bad customer experience with 17 people, while consumers who do use social media will share that experience with 53 people. But social media is more than an onslaught of complaints and sharing bad experiences; it’s a gold mine of useful data. Monitor relevant keywords and listen to get ahead of bad experiences before they happen. Predictive customer service will be able to create incredibly positive experiences for your customers in the future. In the United States, 71% of people own a smartphone. Millennials comprise the largest segment of smartphone owners with 85% of Millennials age 18-24 owning devices in Q2 2014 and 86% of Millennials age 25-34 owning them, and these numbers are on the rise. Four out of five Millennials sleep with or next to their cellphones and 41% of them don’t even have a landline. This leaves no doubt that companies and brands need to have a strategy in place to address customer service complaints (and to capitalize on positive customer service sentiment) on mobile devices. 60% of customers change their customer service contact channel depending on where they are and what they’re doing. Connected customers are constantly moving, switching from channel to channel as it is convenient for them. Despite the movements, they still expect a seamless, consistent experience at every point of contact and interaction. A consistent experience across all channels and touch points is something that Millennials have come to expect, regardless of where they are in their customer journey. The Harvard Business Review noted that companies that can successfully manage the end-to-end journey enjoy greater customer satisfaction, less churn, increased revenue, and higher levels of employee satisfaction. In addition to meeting or exceeding customer expectations, businesses can also attain valuable insights that can help improve the customer experience even more. Customers want a more relevant, tailored experience from their favorite brands and, with all the actionable big data out there, you can’t afford to be the only business that doesn’t meet that demand. Data from the 2014 EKN Millennial Study showed that consumers are willing to pay up to 41% more for an excellent customer experience, including personalize engagement across all touch points. Increasingly, customers want and expect personalization and the amount of customer data that exists to be harnessed is enormous. Collecting that data is of the utmost importance of companies and brands that are focused on the customer experience. However, it is imperative that you have a clear strategy for understanding and applying these insights along with a defined metrics. Insights should be used to create a personalized experience for customers that gives them what they want when they want it without crossing the line into being invasive or "creepy" and turning a customer off by revealing that you have too much of their personal data. Providing data-rich information and tailored results leads to an enhanced experience that Millennials will respond to and creates the opportunity for you to build trust and direct relationships with your customers. Customer experience in the digital age is perpetually evolving as new technologies and trends continue to emerge. Mobile, cloud, big data, the Internet of Things. Dizzying as the rate of change may sometimes feel, it only shows signs on increasing as new innovations hit the market every day. To keep up, companies have found success in fostering a culture that embraces change and innovation across all levels of the organization with the understanding that a superior customer experience across all channels and devices will drive growth and revenue in the future. The digital transformation of your business to suit modern customer experience expectations from Millennials and all digital consumers is not something that any business should be lagging behind in. In our digital economy, customer service needs to keep pace. 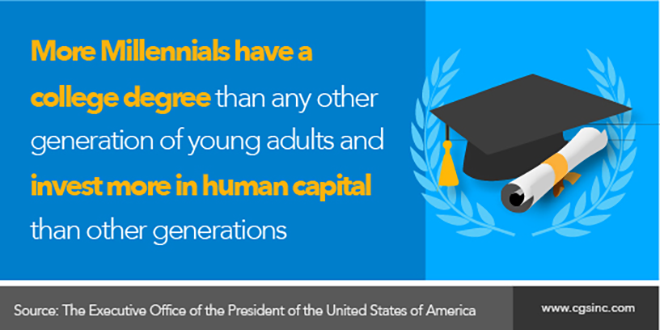 Whitehouse.gov, "15 Economic Facts About Millennials," The Executive Office of the President of the United States of America, [Online]. C. Altchek, "7 facts every busuiness should know about millennials," Fortune, [Online]. "Consumer Barometer with Google," Google, [Online]. N. Brookes, "The multibillion dollar cost of poor customer experience [INFOGRAPHIC]," NewVoiceMedia Blog, [Online]. "2011 Customer Experience Impact Report," RightNow Technologies, [Online]. "2014 Global Customer Service Barometer," American Express, [Online]. K. Taylor, "Millennials SPend 18 Hours a Day Consuming Media -- And It's Mostly Content Created By Peers," Entrpreneur, [Online]. B. Honigman, "10 Ways to Make Customers Fall in Love with Your Business," The Huffington Post, [Online]. S. Barbera, "Customer Experience: 19 Must-Read Stats Even If You're Not In Customer Service," CGS, [Online]. C. Waxer, ""Help for social media mayhem"," CNN Money, [Online]. S. Leung, "The Customer is Always Right (And Boy, Do They Have a Lot to Say)," Salesforce, [Online]. S. Fisher, "3 Great Examples of Crisis Management on Social Media," Spinweb. [Online]. "Mobile Millennials: Over 85% of Generation Y Owns Smartphones," Nielsen, [Online]. M. Solomon, "2015 Is The Year Of The Millennial Customer: 5 Key Traits These 80 Million Consumers Share," Forbes. [Online]. T. Pickard, "10 Customer Service Stats and What They Mean for Your Contact Center," Salesforce, [Online]. A. Rawson, "The Truth About Customer Experience," Harvard Business Review, [Online]. RIS, "Customer Engagement Tech Trends Study: The Personalization Imperative," Retail Info Systems News. [Online].